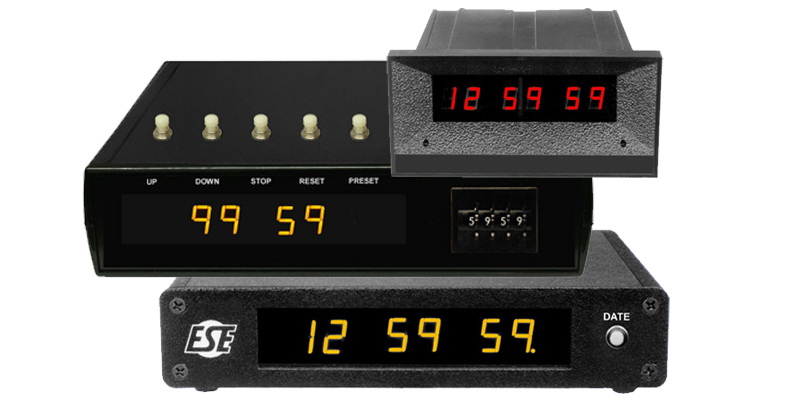 ESE manufactures a wide line of desktop and rackmount Clocks and Timers. Clocks are availble in 12 or 24 hour (military) format; standard Timers are available as 60 minute UP Timers, 24 hour combo Clock/Timers or 100 minute Up/Down Timers. Some, such as the LX-192U/ES-192UE Clock or LX-520U/ES-520UE Timer, provide a Serial Time Code output for driving remote displays. Several display sizes are available - 0.4", 0.56", 1", 2" and 4" as well as several colors including Red, Yellow, Blue and Green.